The Steel Institute VDEh and its partners offer visitors the perfect opportunity to reach their objectives. At this event you acquire the latest information on new ideas and developments as well as on the state-of-the-art in metallurgical process technologies for iron and steel production, steel materials and steel application. Register for the 4th ESTAD as a participant and benefit from early bird fees. Watch the wide-ranging program with more than 660 lectures here. The 10th edition of the major international trade fair for metallurgical plant supplier and manufacturing companies, METEC 2019, will take place in Düsseldorf from the 25th to the 29th of June 2019. This outstanding event started back in 1979 and always takes place in Düsseldorf. Since the first METEC, the Steel Institute VDEh has organized, in close cooperation with Messe Düsseldorf, accompanying metallurgical steel congresses and conferences. In 2013, the Steel Institute VDEh proposed a new event located in Europe, called the European Steel Technology and Application Days (ESTAD), which is open to steel producers, steel users, plant suppliers, research institutes, as well as universities from around the world. ESTAD is hosted in joint cooperation between the Austrian Society for Metallurgy and Materials (ASMET), the Swedish Steel Producers Association (Jernkontoret), Associazione Italiana di Metallurgia (AIM), and the German Steel Institute VDEh. The 1st ESTAD took place in April 2014 in Paris, France, the 2nd together with METEC in June 2015 in Düsseldorf, Germany, and the 3rd in June 2017 in Vienna, Austria. The 4th ESTAD will be held parallel to the METEC 2019, starting with a get-together in the evening of the 24th of June and ending with plant visits on the 28th of June. Between these dates, participants have the opportunity to attend numerous presentations covering the latest technical developments in the world of steel. We are looking forward to welcoming you as a participant, especially during the opening and plenary sessions of METEC and the 4th ESTAD, which will take place on the morning of the 25th of June 2019.
in addition to all aspects of digitalization and Industry 4.0. Today, EU policies request drastically reduced CO2 emission levels by the year 2050, which is a challenge for the steel industry to achieve with the existing iron and steelmaking processes. New technologies need to be developed. Steel, with its manifold applications, is a CO2 mitigation enabler, but must also compete with other materials currently on the market or in development. The steel industry has to remain one step ahead and continuously needs to move forward. 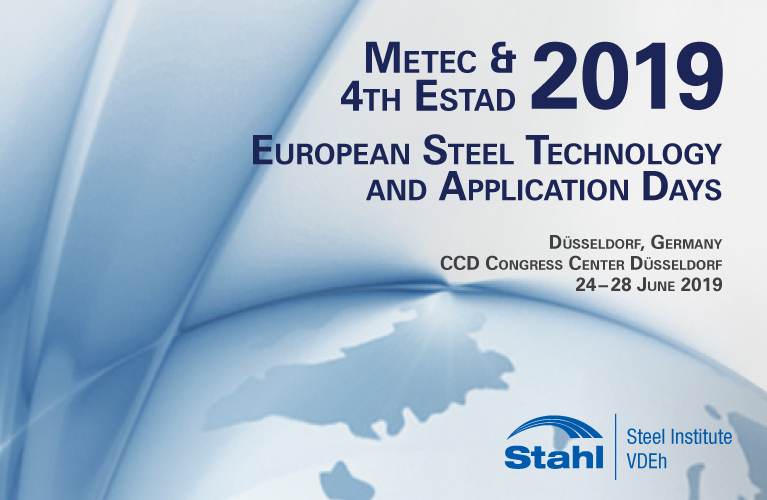 The METEC and the 4th ESTAD will give answers to many of the pressing technical questions at hand and will therefore contribute to the further success of steel in Europe and in the world. I would like to thank all the speakers and their co-authors at METEC and the 4th ESTAD in advance for their efforts in preparing the papers for this outstanding event. I am looking forward to meeting you in Düsseldorf between the 24th and 28th of June 2019.